Team Canada is bringing five athletes less familiar to west coast fans to compete in the Richmond International. Nova Scotia's Trendal Hubley-Bolivar and Newfoundland and Labrador's Darlene Jackman are likely to play with rookies Mark Ideson and Mike Munro from London, Ontario, on Canada II, while Ontarian Collinda Joseph replaces Anne Hibberd on Bruno Yizek's Alberta side. Though Mark and Mike have only been curling a year, their coach Ernie Comeford is impressed with their rapid progress and is convinced they will be major players in the future. "After all Jim, Daryl and Bruno are over 60 and both Mark and Mike are in early 30s at the most. The potential is there," he said. They also fit a physical profile attractive to the national coaching staff. 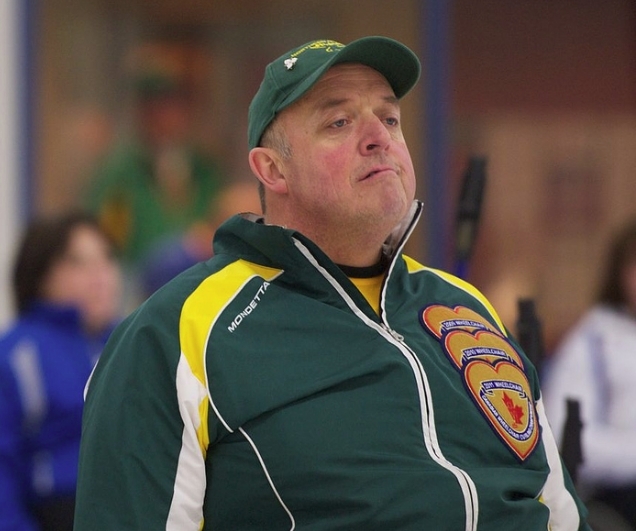 Mark Wherrett, who appeared on all four Northern Ontario national championship teams, the past three as vice to Wayne Ficek, has relocated to Winnipeg. "I moved back to Winnipeg late last summer," he said, "and have been curling with the gang in Winnipeg, I played basketball with Chris, George and Dennis in the eighties. I also lived in Winnipeg up to 2000 so it was more like coming back home. The curling rink in Dryden closed this fall so it turned out to be a good move for me with being able to continue to curl." Mark replaces Don Kalinski on the Manitoban "Team Cascade" at this year's Richmond International, but leaves Wayne Ficek short of a third back in Northern Ontario. Team Ficek's Chester Draper and Cindy Hoffstrom also curled out of the defunct Dryden CC and their playing status for the coming season is unclear. Manitoba, the current national champions, were a team born into controversy with some consideration given by the Province to not appearing at the 2011 Edmonton Nationals. Gold medals probably eased any Curl Manitoba qualms about sponsoring a self-selected and unopposed provincial representative. A proposed Spring meeting to discuss minimum playdown requirements and/or selection protocols apparently did not materialise, but as this season begins, skip Chris Sobkowicz has gathered a group of eight who are participating in a development program sponsored by Cancade Inc. They play in 3 mixed leagues, practice twice a week, and play in 3 different two person stick leagues. "It's completely open to anyone," Chris told me. "It's like a sports academy where we all learn the same strategies and techniques, work collectively on our program of activities with a competitive angle, and of course enjoy each other's company. "We'll be hosting a "You can Do it" camp later in November headed by coach Rob Lamb and the MCA. This will focus mainly on people new to the game, and offer a recreational component." "Team Cascade" will compete in next week's Richmond International, with Northern Ontario transplant Mark Wherrett replacing Don Kalinsky from the national championship squad. The 2012 Team Manitoba will be chosen by provincial team coach Rob Lamb from those participating in the Cascade programme. The 5th Annual International Bonspiel organised by the Richmond Centre For Disability begins Wednesday November 2nd at the Richmond CC, with a full 8 team round robin ending with the playoff round Saturday November 5th. Team Canada will be fielding its World Champion team in their final competitive appearance before they defend their title in South Korea, Feb. 18-25. Also competing for the $1,000 first prize will be the 2011 Quebec champions, the Manitoban and Albertan finalists at the 2011 Nationals, 2010 National Champions BC's Team Cormack, Team USA, a mixed US and Canadian RCD team, and a Canada II team tba. The event boasts the most compettive fireld outside of the natonal championship, and viewing is free. Teams can practice Tuesday afternoon, and Draw One begins Wednesday at 9.30am. 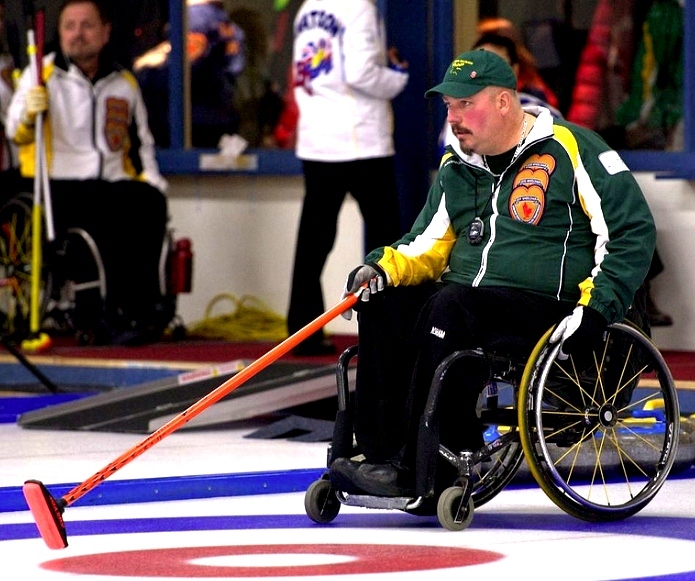 CurlAtlantic is sponsoring eight weekends where wheelchair users and anyone interested in wheelchair curling can learn, practice and develop their playing and/or assistance and coaching skills. The free sessions will include on and off-ice time and will be led by Trendall Hubley-Bolivar, a 3-time Provincial Champion and current National bronze medalist. Contact Katarina Hakansson (902 240-9870) for more information. The 3rd Asian Friendship League begins Friday, October 28 through October 30, at Moseushi Curling Hall, in Hokkaido, Japan. Six teams are competing with China's Prague World Championship team joining Korea's 2011 World's silver medalists challlenging four Japanese teams. More information for readers of Japanese is available HERE, while entering the page url into Google Translate is an option for the rest of us. Two time Paralympian gold medalist and current Team Canada lead Sonja Gaudet, already the photogenic ambassador for Canadian wheelchair curling, will grace a month of the 2012 Women Of Curling Calendar, being sold as a fundraiser for Shoot For A Cure, a spinal paralysis research charity. You can read more, and order a copy of the calendar, HERE. Eight US wheelchair curlers have been selected to form the playing pool from which Team USA 2012 will be chosen after a 14 candidate three-day individual tryout competition at the Madison CC in McFarland, Wis.
Gerald Wynne Jr. (Plover, Wis.) who received a donated wheelchair from Ki Mobility of Stevens Point, Wis., to assist in his quest to make Team USA. The first four all have previous international experience. The selection was based on individual skills testing, game participation and strategy assessment as well as interviews to determine team/player compatibility. The squad will participate in the several highly competitive wheelchair curling events in November to help determine Team USA at the 2012 World Wheelchair Curling Championship Feb. 18-25 in Chuncheon City, South Korea. Torino gold medal skip Chris Daw has been "released" from his contract as Manager of the Vancouver CC just prior to the club moving into its new premises as part of the Hillcrest Centre, the 2010 Olympic venue. He has now returned to Ontario with his family. You can read his account on his blog. The Hillcrest Centre officially opens this Saturday, October 29th, and the curling ice will be fully wheelchair accessible. Russia II proved the class of the field, winning the final of the Kinross International 9-4 over Scotland II. Switzerland won their last two games to take second place in Group A, going on to beat Group B runners-up Norway 9-4 for 3rd place. Norway earned their playoff spot on ends scored, after tying with Canada II and Scotland 1 in round robin play. Ina Forrest rejoined her Canada I team in Amsterdam prior to their flying to Scotland. 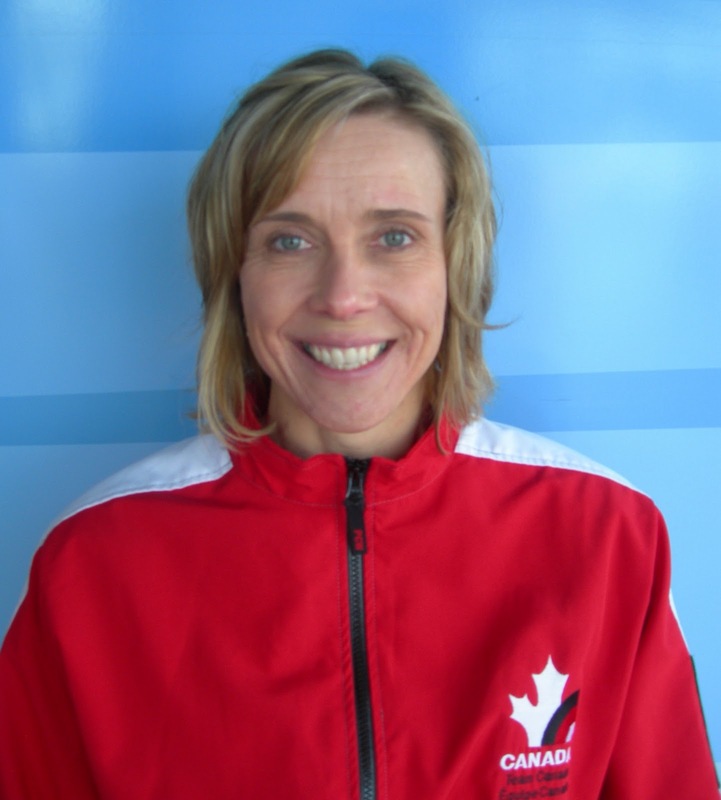 TC coach Wendy Morgan professed everyone was pleased with the result though neither Canadian team qualified for the playoffs. "Early season tweaking ... everyone pleased." Bruno Yizek and Chris Sobkowicz shared skipping duties on Canada II. An organiser's report on the final day can be read HERE. Terje Rafdal,Rune Lorentsen,Maria Duncan,Sissel Lochen,Jostein Stordahl. Augusto 'Goose' Perez was the third Tam USA member, with Jacqui Kapinowski and James Pierce, to quit the program over the summer. This throws team selection wide open as 14 candidates gather at the Madison CC in McFarland, Wisconsin, the new centre for wheelchair curling in America, for the annual selection camp October 20-23. Jimmy Joseph (49, New Hartford, NY) is the one survivor from the 2006 and 2010 Paralympic team and he will be joined by 2010 Paralympian Pat McDonald (44, Madison WI) who has moved his family from California to be more involved with the program. Penny Greely (40, Green Bay WI) returns from the 2011 team, and Bob Prenoveau (46, Chittanango NY), who was a part of the 2005 and 2007 World Championship teams, is the other athlete with international wheelchair curling experience. The 3-day camp will select eight who will then compete at two November events before the five person team for the 2012 Worlds is announced. National coach Steve Brown heads a five person selection committee looking for individual skills, game participation, strategic understanding and that catchall loved by coaches, "team/player compatibility." The eventual five will also have impressed in cumulative performance, on/off ice behaviour, team dynamics and training regimen. Scotland II beat Switzerland 8-6 on the strength of a 5 spot in the 3rd end of the morning sraw, and continued with a 7-6 defeat of Scotland III to stay top in Pool A at the end of Day 2 at the Kinross International. Russia II beat Canada II 6-4 after three consecutive steals put them ahead 3-0 at the midway break, maintaining their unbeaten record atop Pool 2. Canada I bounced back from their opening defeat, beating Scotland III by 8-4 and Russia I by 10-3. Team Canada is one of five finalists for the International Paralympic Committee's "Best Team" Award. 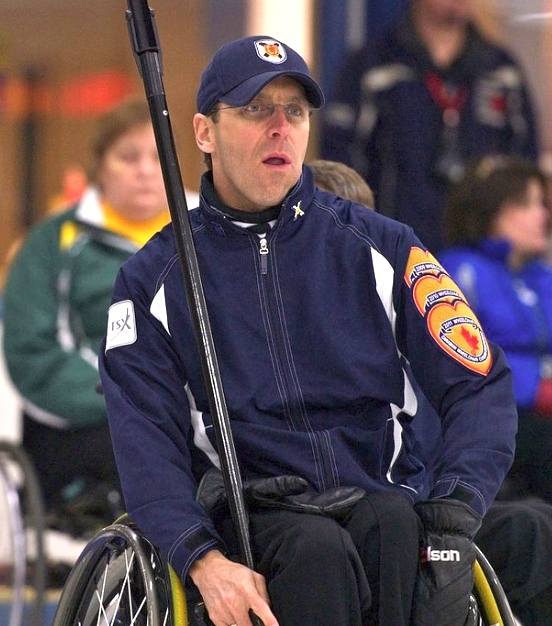 Jim Armstrong, Darryl Neighbour, Ina Forrest, Sonja Gaudet and Bruno Yizek defended Canada's Paralympic title with a 7-2 round robin record before beating Sweden, and then Korea in the final. Also being considered are the US and Japanese Sledge Hockey teams and the Russian Men's and Women's Cross Country Skiing Relay Teams. The winner will be announced in December. The IPC news release is HERE. Canada's two teams played in the final of the Norway Open on Sunday and two days later faced Scotland's best on the opening day of the Kinross International in Scotland. They lost both games, giving up a steal in each final end. The ten team tournament includes teams from Norway, Latvia, Russia and Switzerland competing in two pools, with the first and second in each pool competing in Thursday afternoon's playoff. In other results, Switzerland beat Russia 1 by 7-5, and Russia II beat Norway 8-5. Latvia and Scotland III had byes. The South Lanarkshire Wheelchair Curling Club is applying for a community development grant from the Royal Bank of Scotland. You can read about their application HERE. The club trains regularly at the Hamilton Ice Rink and will host an international event next January 18 and 19. Secretary David Morgan said: “The money would go towards the international event as well as the development of the club. “It’s important for people to vote for us because there’s so many wheelchair users that are caught up in poverty and can’t get access to funding which leaves them isolated because they can’t get out. The organisation is hoping to run a special event on St Andrew’s Day this year and preparations are also underway for 10th birthday celebrations in February. Voting closes at midday (7am eastern time in north America) on October 24. Here's the RBS voting page. It's a bit of a pain as you have to register before voting, but it's worth the 3 or 4 minutes that will take too support a club that is showing real initiative. 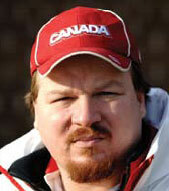 Jim Armstrong's Canada 1 took the 2011 Norwegian Open with a 7-3 win over Bruno Yizek's Canada 2 team. Denmark beat Finland 4-3 to take 3rd place. Canada 1 were one player short (see yesterday), which in a game without sweeping and all other things equal, offers an advantage to the players throwing three stones. Norway 1 only got to play one match against Canada in this weekend's Norway Open and were comfortably handled by Bruno Yizek's Canada 2 as the Canadians swept into tomorrow's final. Finland play Denmark for 3rd place. Ina Forrest was unable to travel because of a family bereavement, but will join the team in Scotland. 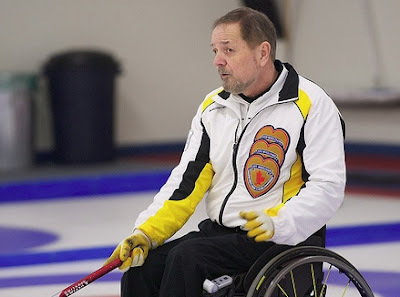 Jean Mills' fascinating series of athlete profiles for the CCA continues to include wheelchair curlers with this week's focus on Northern Ontario champion skip Wayne Ficek. Read Wayne's take on a rule change that would improve the sport, and much more, HERE. Both Canadian teams posted big margin wins in the opening draws of the Norwegian Open at the Halden Curling Centre. The draw and results are available HERE. Team Canada's only international trip before defending their World title in South Korea next February is to Norway, where they play this weekend, then on to Scotland the following week. The Norwegian Open, to be held at the Halden Centre starting Friday, failed to attract any other contending teams and will serve as a warm-up for the Kinross event beginning next Tuesday. Canada is fielding two teams with Calgarians Anne Hibberd and Jack Smart joining the six carded squad members. In Norway, roles and positions will be flexible, but Canada's medal team expect to play together in Scotland. The eight teams in Norway include four local teams, plus Finland and Denmark. As part of its 50th Anniversary celebration, the volunteer run Capital Winter Club in Fredericton NB has almost reached its $60,000 fundraising target that will, with matching provincial funds allow the installation of a lift to the upstairs viewing area. Club president Rob Wight told The Daily Gleaner: "we're hoping to extend that at some time in the future to where we can actually have wheelchair curling and give people with disabilities access to the ice." There will be a "taster" session at The Peak in Stirling from 2.30 to 3.30 on Wednesday October 5th. Stirling WCC has 13 regular curlers and is actively seeking members. 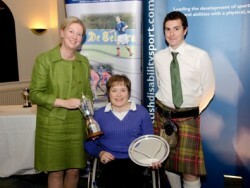 Team Scotland skip Aileen Neilson was awarded the coveted Gordon Brown Memorial Trophy at the Scottish Disability Sport's AGM on September 28th. This honour is voted for by fellow athletes to the individual who has excelled at the highest level in their sport.